"Warmest Day," the first single to follow our Silk Royal Showcase 03 compilation, is a stunning downtempo composition by breakthrough Finnish act Our Stolen Theory. The Original Mix has now been given several inspired peak-hour interpretations by some of the most exciting talents in modern trance and progressive: Mike Shiver, Johan Vilborg, and Nigel Good. Early radio support for Shiver and Vilborg's collaborative remix has already come from Above and Beyond, on their acclaimed weekly radio show and podcast "Group Therapy." The single kicks off with an anthemic remix by Mike Shiver and Johan Vilborg, a brilliant partnership between a trance legend and a veritable rising star. More specifically, globetrotting DJ and producer Mike Shiver has contributed to Anjunabeats, Armada, and his own Captured Music imprint for the better part of a decade, and his recent single "Ohh" on the Anjunabeats Volume 10 compilation was hugely supported by international trance fans and DJ's alike. Meanwhile, Vilborg is still riding the momentum from a massive breakthrough year in 2012, in which he released several acclaimed EP's and remixed Dinka's "Lotus," recipient of "Record of the Week" on Above and Beyond's "Trance Around The World" radio show. In many ways, there was an element of destiny behind this collaboration: not only are they fellow Swedes, but they also share a passion for emotive, uplifting chords and stadium-rocking grooves. As to be expected, their remix kicks off a with a pumping rhythm section, while a layered bass begins to filter into the mix. Meanwhile, in the background, some of the vocal echoes of OST's original vocal are teasingly introduced. At the quarter turn, as we are first met with the "your life" vocal hook, the electro-tinged bassline explodes through the mix. The bass continues to crescendo as the song approaches the midpoint, while several "wobbles" and other dynamic bass effects reinforce the dancefloor euphoria. With great anticipation, the main break drop arrives, revealing a poignant guitar solo from the original mix. This is followed by OST's memorable and truly beathtaking main vocal line: "Guess you noticed, life is here right now." With the completion of the full vocal verse, the rapturous lead chord progression re-appears likes a shot of pure adrenaline, especially when coupled with the gut-busting drop to follow. The second remix in the package comes courtesy of Silk artist-of-the-moment Nigel Good, who has been on the warpath of late with a flurry of well supported remixes and singles. Specifically, his latest original "The Balance" has been played on radio by Above and Beyond, Max Graham, and tyDi in recent weeks and reached the Top 5 on Beaport's Progressive House Release Chart (as well as the Top 20 in Overall Releases); earlier this year, his standout remix of Aerosoul's "Time Is By Your Side" was featured on radio by Myon and Shane 54, Solarstone, and many more. Although Nigel's remix could accurately be categorized as a peak-hour stormer, the house-y rhythm lends the track a genre-bending versatility. Early on in the track, a signature electro-tinged bassline is introduced, as well as a radiant chord progression. Another Nigel Good trademark is presented soon thereafter: a gorgeous array of futuristically-processed vocal stabs, derived from the original vocal and other samples. Finally, OST's verse arrives in full splendor, with the many other instrumental elements offering great support behind it. Just as the build gains full momentum, it gives way to a poignant main break, in which the main vocal theme is coupled with an emotive piano score. The drop to follow is a pure dancefloor killer, as the layered bassline furiously cuts through the mix. A funky, Daft Punk-inspired synth adds even more flavor to the ebullient soundscape. 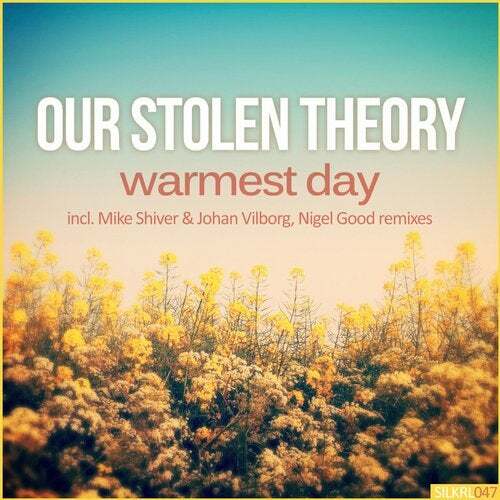 Finally, Our Stolen Theory's Original Mix has been featured here as the closing track. Although it is a downtempo cut, it is presented here again (after initially appearing on Silk Sofa) as a much deserved reminder of its blissful and deeply poignant sound. The song centers on chilled, early-morning pads, as well as several beachside guitar riffs. There's also a glitchy, broken breakbeat, which propels the track forward and offers a bit more hop to an otherwise relaxed soundscape. This rhythm slowly picks up energy, leading into the highlight of the track: the stunning break, in which the main vocal theme is introduced. The hopeful lyrics are not only beautifully rendered, but are deeply poetic and "timeless" in their meaning.